Leaky Gut is a strange topic to discuss and you are most likely not sure what it is if you have not been around Functional Medicine circles, such as Dr. Axe or Dr. Isabella Wentz, Pharm-D. It just sounds bad. I hope to show you its significance and help you to recognize it. The short description for Leaky Gut is where your stomach leak substances into your blood stream that is not supposed to be there. There is a barrier separating your gut to the blood stream called epithelial cells, which is one cell in thickness. There are proteins called “tight junction” proteins that allow the nutrients into the blood stream while blocking other substances from entering. What happens in a leaky gut is the tight junctions are no longer tight and allows un-natural substances to enter the blood stream. The body recognizes these substances as foreign objects and attacks it. All kinds of functions take place in the body to attack it, causing inflammation, which causes other health conditions. It is now believed that much of the different known auto-immune diseases may start with a leaky gut. What causes a leaky gut? There are several and the most prevalent is our dietary choices. We eat too much processed foods, refined foods, inflammatory foods, etc. Inflammation is one of the main culprits to many of our chronic health issues that are brought about by poor dietary choices. 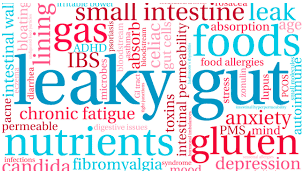 Dr. Axe has a great article called, “Leaky Gut Syndrome: 7 Signs You May Have It.” He does a great job explaining it all, so I do not have to. I highly recommend you read it! Leaky gut or any gut problems has much to do with our gut flora. This is the good bacteria in our gut necessary for a healthy gut and proper digestion. Many things can damage our gut flora, such as, antibiotics, toxins, preservatives in foods, and certain types of foods. A good prebiotic and probiotic will go a long way to correct any gut if the normal gut flora has been damaged. However, it is imperative that other changes be made and not just adding good bacteria into your gut. Dietary changes must be made to positively impact long-term overall health. Dr. Nick Zyrowski has a great video describing what is an inflammatory food called, “Inflammatory Foods.” I recommend an anti-inflammatory diet to anyone I counsel that show signs of an inflammatory condition, anyone who has abdominal weight gain with high glucose and insulin, anyone with an auto-immune disease, arthritis, etc. Did you know that inflammation causes most of our chronic health diseases in the US and it is from our dietary habits? I have written a blog on gut health called, “Gut Health Affecting Overall Health.” Poor gut health leads to so many illnesses. In Functional Medicine, it is said to “heal the gut first”. Many of the people I counsel have illnesses, syndromes, and health problems stemming from poor gut health. It is sad, we are not often instructed on the importance of good gut health. I just finished a good “cleanse and detox program” as part of our Weight Loss Protocol we have developed at CPT, and it is amazing how much better I feel. There are several things we can do to fix our leaky gut. We first need to know what the bad foods and the good foods are for healing a leaky gut. “The Best and Worst Foods for Healing Leaky Gut” is an excellent article listing the foods for correcting a leaky gut. There is a “4 R Program” which is a protocol for correcting a leaky gut. The protocol focuses on, (Remove, Replace, Repopulate, Repair). This is another excellent article for good gut health. Once you have cleansed, there is a protocol for helping you find what foods that may be causing your gut issues. It is called an “Elimination Diet.” The protocol takes you through a series of adding foods one at a time to see which ones causes problems. This protocol seems cumbersome and takes a little time to work through, but it may be just what you need for better overall health. What are the functional medicine options for healing a leaky gut? Designs for Health, one of our main suppliers for supplements, has a “Leaky Gut Nutrition Support Protocol” that is as good as any. It gives you good lifestyle recommendations and dietary tips and caveats. It also as a list of recommended supplements. Other products I recommend include Digestzymes for providing enzymes to help in the digestion of proteins and fats. Another product recommended for those that want a vegan option is Plant Enzyme Digestive Formula, which supports the digestion of carbohydrates as well as proteins and fats. Dietary choices are of vital importance to protect our gut health, which effects our overall health. It will take a strong commitment and discipline, but change can occur, and you will not regret it. We have developed a “Weight Loss Protocol” and I have posted an article with products and education for helping you make those good dietary choices by helping you establish sustainable healthy habits. I also have a video describing our “Weight Loss Protocol” and its benefits. I recommend both if you are interested in support for making changes to your dietary lifestyle. There is a lot of information here. I hope and encourage you to take your time going through it all. It may positively impact your life in a way you never expected. I hope you learned something today! Please give us a call if you have any questions about this post or about any of the supplements mentioned. We can have any supplements drop-shipped to your front door if you are interested. You can call us locally at 251-626-2820 or toll free at 866-591-6337. You can also go to the section below this post called “Consultation calls for Medical Providers and Patients” and click on the Learn More button to schedule a consult. Thank you for your time and have a blessed day!